This shelf is designed for EuroCave Performance Built-In and Compact Series Wine Cellars. Revolutionary Design! Individual "hands" cradle and protect your bottles! No more rolling bottles or rattling glass! EuroCave, makers of the world's finest wine cellars, have introduced another breakthrough in wine storage, Main Du Sommelier shelving. A must-have for every EuroCave owner, Main du Sommelier ("Hand of the Sommelier") shelving features 8 adjustable "hands" that cradle your bottles individually and securely, just as a restaurant sommelier would. Each individual hand is a slightly concave bottle-holder lined with rubber insets to prevent bottles from rolling, rattling, or clinking together when sliding the shelf (in or out). Adjusts to accommodate different bottle shapes and sizes! EuroCave engineers recognize that wine owners have collections of varying bottle shapes and sizes. To accommodate this, each hand of the Main du Sommelier (MDS) can slide along the width of the shelf, allowing you to create proper spacing between each bottle. To shelve bottles larger than standard Bordeaux size (750mL), either slide the hands to make the appropriate spatial adjustments or remove a hand or two entirely (depending on your needs)*—no other shelf can do this. Promotes sustained humidity and uniform temperature! Keeping bottles secure and spaced properly improves bottle stability and air circulation within the cabinet, helping to maintain humidity and uniformity of temperature. So now every bottle is fully exposed to optimum storage conditions within the cellar. New Wood, New Color, Eco-Certified! The front trim of the MDS rolling shelf is made of eco-certified beechwood, sourced from sustainable forests to support healthy ecosystems. The new beechwood trim is slightly lighter in color than EuroCave's original sapele trim. If you'd like to upgrade your existing EuroCave with new MDS rolling shelves, we suggest purchasing a full set to assure all of your shelves match. 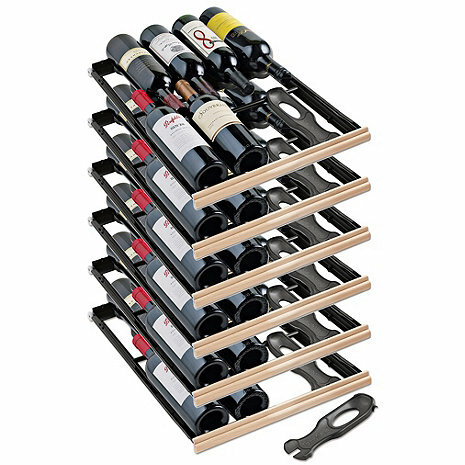 Main du Sommelier Rolling Shelves now come standard in all EuroCave Performance wine cellars. MDS shelves, although compatible with Digital Comfort and Premier, are sold separately. Current EuroCave owners can upgrade their existing units with MDS shelves immediately. *Note: The average maximum capacity for the MDS shelf is 8 standard-size 750mL Bordeaux bottles. Storing larger bottles, such as Pinot Noir and Rhone, may decrease shelf capacity. will this fit in V259? could this fit in a regular refrigerator? what are the dimensions? BEST ANSWER: Thank you for your question. Eurocave shelves are specifically made to only fit the Eurocave units. The Main du Sommelier shelves will fit in the Eurocave Comfort and Performance lines. If you have any further questions please feel free to contact us at 1-800-377-3330. Great replacement shelves for my old Eurocave wine unit! Much better than the originals.